Whether you prefer the versatility of a sold color or the sophisticated look of stripes, you get both in this creative, reversible bag that gives you twice the fashion. 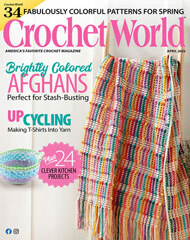 This e-pattern was originally published in the Spring 2012 issue of Crochet! magazine. Size: 11" x 10", excluding handles. Made with medium (worsted) weight yarn and size I/9/5.5mm hook.